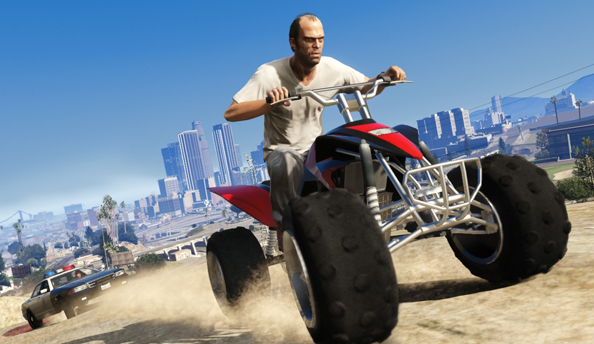 December was the biggest-ever month for Grand Theft Auto Online. This is stated in an announcement from Rockstar who also confirm that 2017 was the game’s biggest year so far. GTA V publishers, Take-Two, recently announced that all of their future games will have microtransactions. Rockstar’s announcement opens saying, “we’d like to salute the population of Los Santos and Blaine County for another banner year of civic mayhem,” referencing the many updates the game went through last year, from Smuggler’s Run to the recent Doomsday Heist. It goes on to say that “2017 was the biggest year of GTA Online yet, capped off by an epic December that saw more players in the game than ever before.” For the record, that’s a four-year-old game continually breaking its own records – no real surprise, as last year it was announced as the USA’s best-selling videogame of all time. Elsewhere in the announcement, Rockstar hint at some new game modes arriving in the coming weeks, as well as show off a new vehicle. The Lampadati Viseris is now available in-game at Legendary Motorsports.